After seven years in the country parish of Arbilot, Rev Thomas Gurthie was called to serve at Old Greyfriars. His initial impressions of the parish were not good. The Cowgate appalled him. He described it as, “one of loopholed poverty, where men and women were hung with rags, and naked, cracked red ulcered feet oflittle shivering creatures trod the iron streets”. Guthrie’s heart was stirred to the utmost depths by the wretched poverty he saw around him. Having surveyed the scene and thought how best he could deal with it, Rev Thomas Guthrie devoted his entire energies to the moral, social and educational improvement of his parishioners. Rev Guthrie at that time belived in the established church of all classes. He was annoyed at the Edinburgh town council laying on seat rents which merely excluded the poor. In 1840 he got a new church and parish close to the Cowgate called St Johns (this is different from the one at the West End of Edinburgh city centre, which is episcopalian). Here he was able to instigate a highly successful experiement. That of allocating one portion of the seating to local parishioners, and allowing the rest to be let to the public at high rates. He had not however been minister at St Johns for long before the revolution of ecclesiastical arrangements which affected the whole of Scotland, the Great Disruption. The focus in this article is his work for the poor. On visiting a decaying borough on the south shore of the Firth of Forth he saw a tavern landscape painting depicting the kindness of a Portsmouth cobbler. 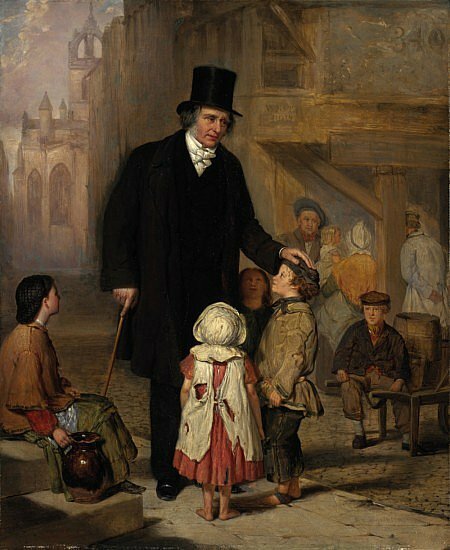 This man took pity on the ragged children, gathered them in and brought them God and the world. He rescued no less than 500 of these children from misery. From that moment the idea of creating a ragged school became fixed in the mind of the Rev Thomas Guthrie. Not sure of the source used for this comment, but I do like it.